It could be argued that Donald Trump’s arrival in the White House has come at the perfect time for the U.S.A.’s number two defense contractor, Boeing. If for no other reason than his assault during the election on the cost of Lockheed Martin’s F-35 program created an opening for Boeing to put a lower-cost alternative back on the table. Lockheed Martin’s F-35C won’t be ready in time, enter Boeing and an F/A-18 Super Hornet upgrade. Source: Adobe Stock/Spacekris. At the same time, the U.S. military, particularly the Navy, are facing a bit of a problem with their older F/A–18 Super Hornets. 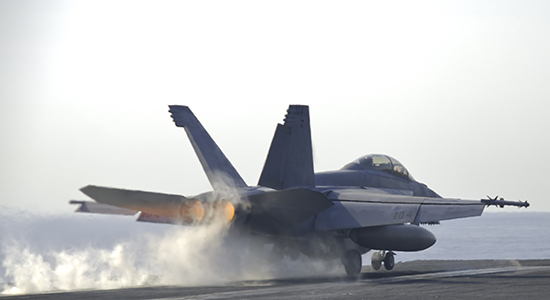 As an article in Sea Power magazine notes, after 16 years of nearly constant combat in Afghanistan, Iraq and Syria the F/A–18 Super Hornet is in danger of exceeding it’s 6,000 hours of operational life way before it had been expected in the next decade. Meanwhile, the Navy variant of the F-35, the F-35C is still a long way from being finished and ready for service. 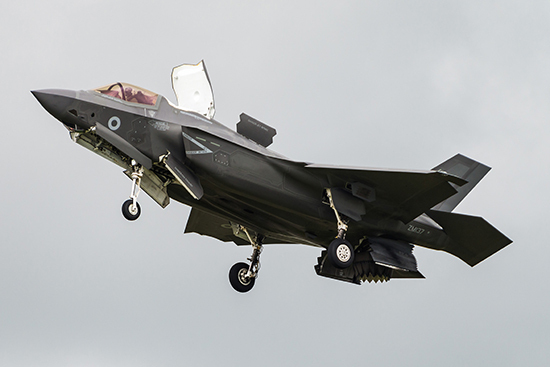 Largely because of the compromises Lockheed Martin has had to incorporate into the F-35 program for the Marine Corps’ F-35B vertical-landing jet, the program is way over budget, running late and, still, according to Bloomberg has major operational capability shortcomings to overcome. This opened the door for Boeing to offer an enhanced Super Hornet providing “complementary capabilities” to the Lockheed Martin F-35s, but at a cheaper price. Even Boeing does not pretend that the enhanced Super Hornets, termed the Block III upgrade, would have the full-stealth capability of the F35, but crucially — both new production variants of the aircraft and eventually retrofitted versions of those currently in service — would have an extended operational life from 6,000 to 9,000 hours plugging the gap for the Navy until, and if, the F-35 is fully operational. The Navy recently revealed that 62% of its strike fighters were out of service awaiting repairs according to a Defense News report. Need a fighter that can launch off carriers from a catapult? The Boeing F/A-18 Super Hornet, with some new upgrades, is there for the taking. Source: Adobe Stock/AdobeStock_npologuy. Boeing’s Block III upgrade would do more with than simply extend the operational life of the Super Hornet. The company is no doubt approaching this opportunity with an eye to poaching F-35 sales. Boeing is proposing many enhanced features including an extended range, and the incorporation of the “distributed targeting network” and the “tactical targeting technology system,” two official programs of record, said crudely to be a big computer and a big data pipe. Needless to say, any major upgrade is going to incorporate more advanced cockpit technology, sensors such as infrared tracking and search systems, and even improving the F/A–18’s stealth capability, providing Boeing suggests “complimentary capabilities” to the F-35. Boeing is suggesting, and the Navy seems in agreement, that the F/A-18 will remain a key part of a Carrier group’s aircraft fleet well into the 2030s. But appealing for the attention of a president keen on capturing headlines over cost savings, Boeing is pushing for all they are worth to suggest more Block III F/A-18 Super Hornets would make better financial sense than the full complement of F-35’s.